The February 3 posting entitled Jim DeMint's Thirty identified a strong group of senators who continued to stick together during the start of the sequester cuts on March 1. Add to this Senate caucus Michele Bachmann, Steve King, & Tim Huelskamp from the House as well as governors Sam Brownback, Mike Pence, & Scott Walker & you have an excellent array of people to consider for the 2016 Republican presidential nomination. Governors Chris Christie (NJ) & Bob McDonnell (VA) have squandered any chance for the nomination they may ever have had. Now we all know that Hillary thought it was her turn in 2008, not just for the Democrat nomination but for the presidency, but after she lost the Iowa caucuses to BO she cried before winning the NH primary but BO coasted to victory. Hillary soldiered on & continued her hard work by putting in four years as Secretary of State spending more time @ thirty thousand feet than she did on the ground. I don't know any Secretary of State who visited more foreign countries than Hillary. Especially early on in 2009 I had the feeling BO was sending her on wild goose chases just to get her out of the country while he was pursuing his agenda free of her possible influence. 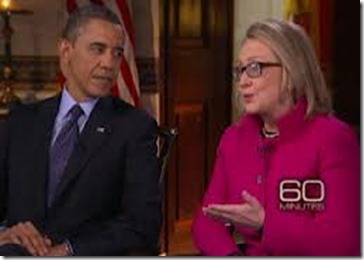 Once she was no longer identified as a threat to undermine BO's agenda she was allowed to make appearances as a supposedly respected Secretary of State with an unspoken understanding that the way was being paved for Hillary's run for the presidency in 2016 – after all she had more than put in her fair share of time in the trenches & earned it – a quid pro quo with BO. In addition her husband helped BO's reelection campaign. Just look @ the above photo to see the fun & admiration they showed for each other in their joint interview on a recent national TV show. They had so much in common during BO's first term – especially not explaining the four murders in the U.S. diplomatic facility in Benghazi, Libya last September 11. Now any of the above Republicans will have to make some spectacular inroads with the electorate to have a chance to win the presidency in 2016 because both BO & Hillary are well versed in the Alinsky Method of community organization which is code for controlling people & winning elections. But all of the current First Lady's publicity is for a reason & Michelle Obama is also an expert in the Alinsky Method & in this case it is Hillary who has been controlled. Unless one of the above strong Republicans catches on big time or Hillary starts to realize what is happening before she is negatively defined by the Chicago machine MO will be the next president of the United States. Hillary always the bamboozler soon to be the bamboozlee. Politics ya gotta love it! Doug - congrats you have totally mastered the Alinksy mindset. Yes it is exactly controlling people and winning elections. With Hillary controlled and with MO promoted with media that is BO propaganda machine, MO may very well be 1st woman President. And BO may then control her behind the scenes. This is a nightmare. Republicans or a 3rd party wake up. Learn Alinsky tactics inside & out or consult with Doug. Too early in the game to make definitive statements. 1. Right after his victory speech on election night 2012 BO called Pelosi to discuss the 2014 campaign & in particular how to win back the House for Democrats – source Washington Post. Every day it becomes more obvious that BO’s most important agenda item is returning Pelosi as Speaker so that his last two years in office will go completely unchecked. 2. An even worse example is the fact that after the 2008 campaign BO never shut down some of his campaign offices in battleground states like Ohio. 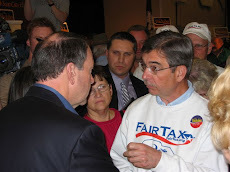 Right after the 2012 election I heard BO Campaign Manager Jim Messina explain the tremendous advantage BO had in Ohio over Romney, where BO maintained an office for over five years compared to the Romney staff showing up a very few months before the election. In this sense BO’s campaign never ended & it is continuing even today – see point #3 below. 3. 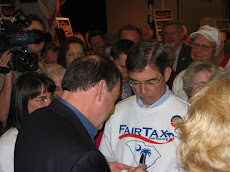 Messina is now in charge of building up Organizing For Action (OAF), an extensive nonprofit network of outside groups and consulting firms with one goal: promoting BO’s agenda beyond the next four years. The idea is to create & maintain an influence across America in support of BO’s policies. OAF’s goal is to transform BO’s re-election campaign into a grassroots machine to support his initiatives. In its early stages, the group is raising millions from big and small donors alike and whipping up support for issues like gun control and comprehensive immigration reform. As of today it is hard to say where OAF ends and the White House starts. The group controls BO’s massive email list and also his campaign Twitter account, which has more than 27 million followers and frequently tweets links to his government website. Here is an OAF video (see next Post). Please note who presents the video if you think it is too early to start an opposition ground game. It is later than we think. If MO did win might as well look for a new country to live in, since America is only the fifth in freedom. If MO and Valerie Jarrett win GOP better start digging the dirt.